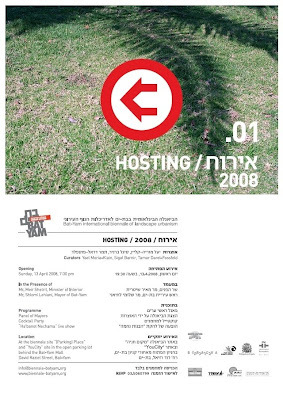 A recent reference reminded me to post something about the Bat-Yam International Biennale of Landscape Urbanism, beginning April 13th, 2008. A summary via Archinect: "This international event will present 30 outdoor rooms in the public domain. All sites will be open to the public and introduce innovative ways for using urban open spaces, integrating community projects and students proposals together with designs by artists, architects and landscape architects." 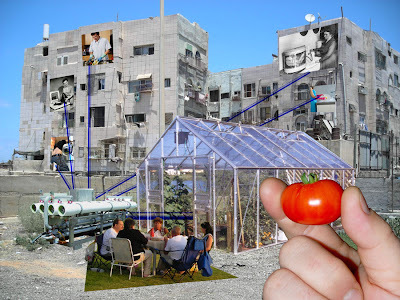 Further explanation from the Bat-Yam website: "The biennale will focus on aspects of hospitality in daily life that generally take place in the privacy of the home. As part of the exhibition "Hosting - 2008", the public space will replace the domestic living room. A series of “Outdoor Rooms” located in open sites around the city will act as points of contact and creativity for hosts and guests. Top-level international and local artists as well as architects and landscape architects have been invited to design each outdoor room as an extension of the home. Architecture and design schools will be integrated into the urban activities. Input will also come from local residents’ organizations and community centers. Planning will be based on ecological thinking, on mixing the natural with the synthetic, and on the use of indigenous vegetation and recycled materials." "A Piece of Paradise presents a model for ecological home-farming in an urban setting. We have constructed a neighborhood agricultural facility, with areas allocated for growing seedlings, for training and gathering, and for garden-beds for edible plants in a communal garden, adjacent to several Bat-Yam apartment buildings. Our objective is to enable the local community to grow a substantial part of the food it consumes, by employing its under-utilized resources, namely available land and recyclable greywater. The project proposes expanding the apartment building into a partially self-sufficient system." "The “City Mix” offers an opportunity for participants to try their hand at creating a “place in the city”: project “residents” are invited to build life size buildings using construction blocks, with virtually no limitations or guiding instructions. 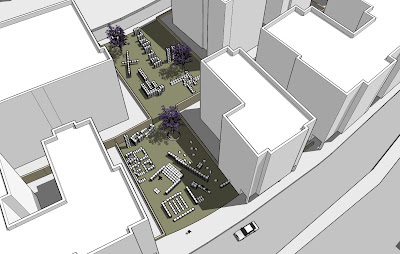 While filling the lot with “private” buildings, project “residents” must also acquaint themselves with the concept of shared public space." And the International Designers offer some interesting ideas - as well as some of the LU rock stars, including Chris Reed from Stoss. 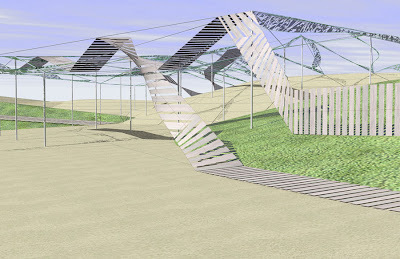 "A reconfigurable dune-garden for an improvised beach-life. ...We start with native dune-scapes, most of which have been erased from the region. 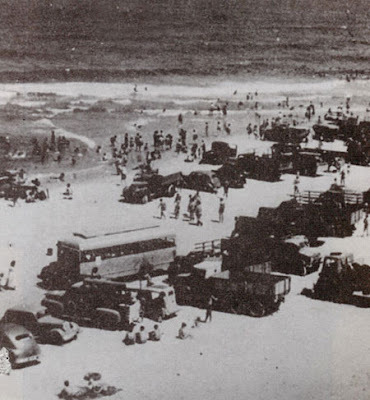 We excavate and dump big piles of sand to form a field of constructed dunes, behind two remnant dunes on the beachfront, at a scale and height that will resonate in this city-scape of high-rises. The dune-field creates two openings, two rooms that invite occupation and use. The northern void, at the edge of the city, is entirely sand but otherwise empty—a provocative contrast to the bustling street. It is a place to lie on your back, nestled into the sand, and to watch the passing clouds, the stars, and to dream. 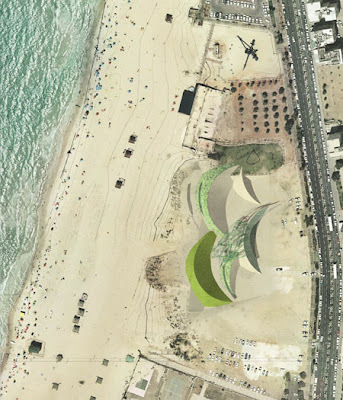 ...wild dune ecologies + deployable mat / fence systems + trained vegetal surfaces + explicit infrastructure = Mediterranean Improv." "'Garden' is a word, a work, a value, a process, something in between. 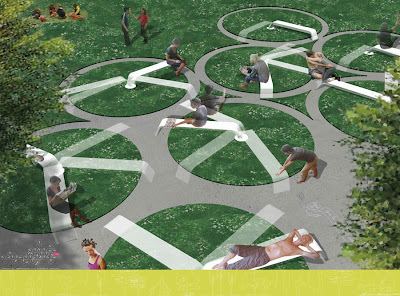 GREEN ISLAND stimulates citizens to “act as a gardener – to be part of a process”. 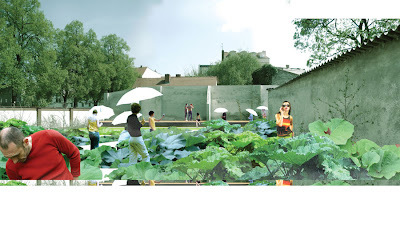 They are working on redefining and improving public spaces in an urban environment, trying to develop even minimal interventions for the creation of gardens, hortus, green oasis, places of communication and interaction." There is also a forum for Young Designers to show of their LU chops. The following project is one example found in this category on the site. 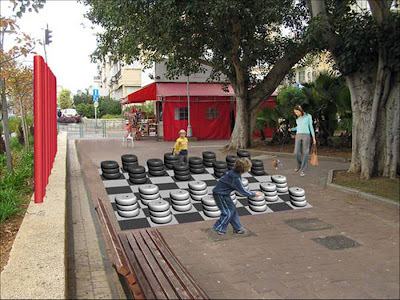 "Public places generate community ties through the opportunities they offer for social interaction. It is this benefit we wish to reinforce and increase by intervening at several locations along an existing boulevard and offering the public a choice of activities. The idea is not to create new places, but to offer interpretations of existing ones, with a focus on the sites characteristics and qualities.. Emphasis will be placed on social and community relationships, taking into account underlying cultural layers of the public realm." There is much more on the site - so if you can't hop on a plane - at least visit it virtually for some thought-provoking ideas and interesting graphics. Thanks to Yael Caron for the info on this event as well... today he sent me a flyer and an update for the opening as well... "On sunday we had the pleasure of Charles Waldheim speaking on the subject of Landscape Urbanism to a mixed audience (academics, city hall people and other locals) - he gave a very comprehensive and encouraging lecture. 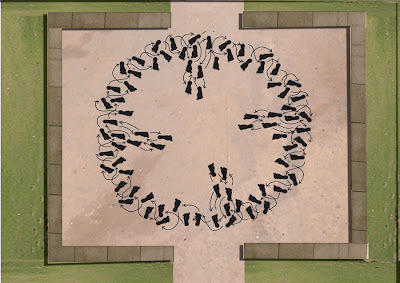 ...We're getting geared up for it next week - can't believe it's actually time...!" Good luck!